I like these kind of surprises. 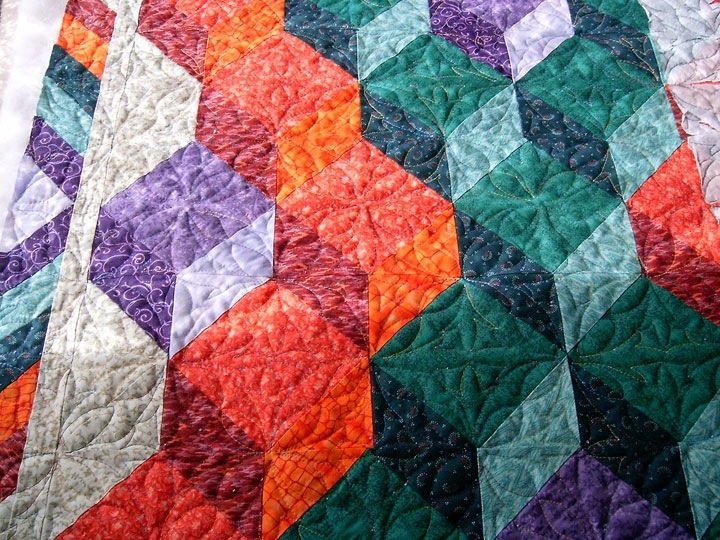 I knew that the quilting was really going to look sharp with this quilt, but this is beyond my wildest dreams! I know that this pic right there doesn’t really show the texture. This is the better close-up I was able to get of the quilting and how the thread worked really well with this quilt colour-wise. I had one spot so far to fix, and I’ve already done that. So it’s ready for trimming and binding. Here’s a wee bit of the texture play with sunlight and shadows. 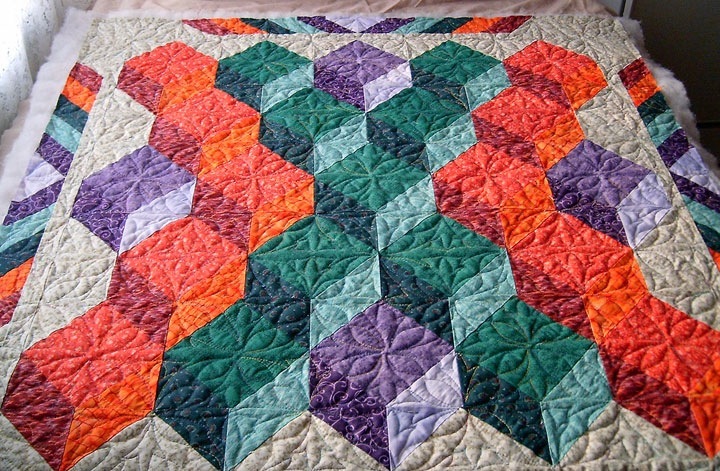 It rather makes it look like the quilting is the higher part and not the part that depressed the batting and made the pattern .. I think that’s a really neat optical illusion for this. These pics are taken a few different angles so you can see how the light plays a huge roll in the texture look of this quilt. I’m still deciding on the binding .. I had a crazy idea that I would try and match up the binding with the borders .. but nope .. not going to go there .. I would lose my bloody mind before I could blink .. oh figuring out the sides would be no problem … but the corners??? Mitered???? EEEEEEEKKKKKKKKK **runs away .. That is so not going to happen .. would i like to see it?? You betcha .. is going to happen because I’ve done the math and figured it out right and there’s no mistakes .. oh HELL no! So I’m left with choosing greens .. the dark or the medium .. I’m thinking that the medium would look better as it would pull the tops of the middle xblocks out and make them pop more .. but ‘m really drawn to a darker colour like the green in the same blocks .. I have plenty to do both .. but am likely going to use the medium green because I do want that POP effect. 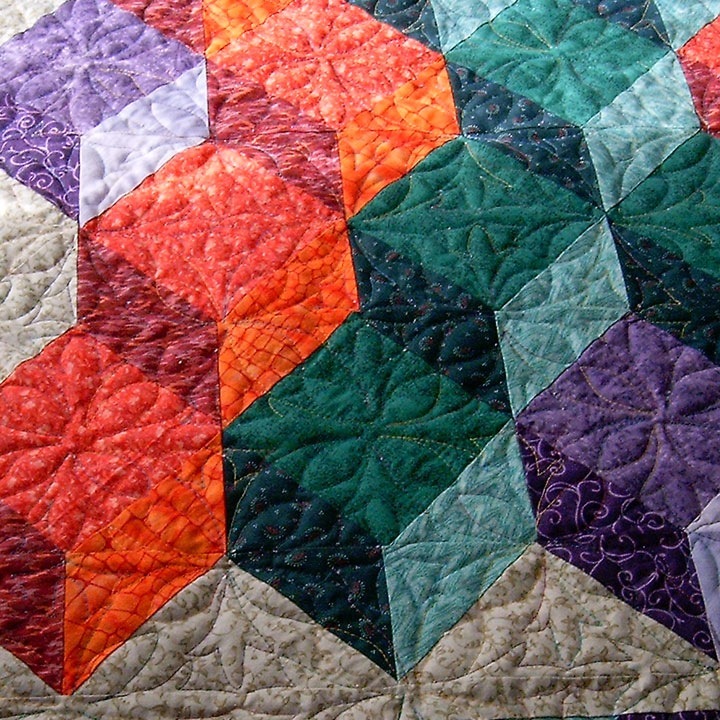 The quilting on this has given the quilt a 3-D effect. This is really awesome, you have done an excellent job Grace. 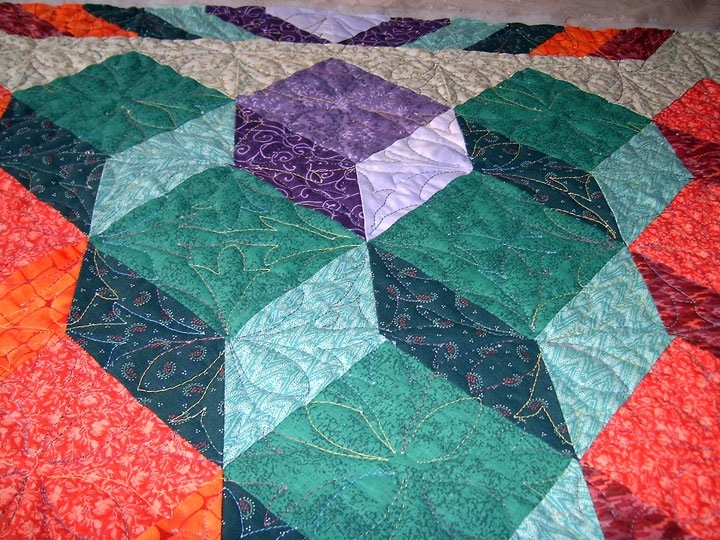 Wow the quilting is magnificent. I wish we lived closer so I could take lessons from you. Keep stitching.. your an inspiration. Grace, that really came out nice. I like the way you got the design stitched on top of each block. You are awsome.